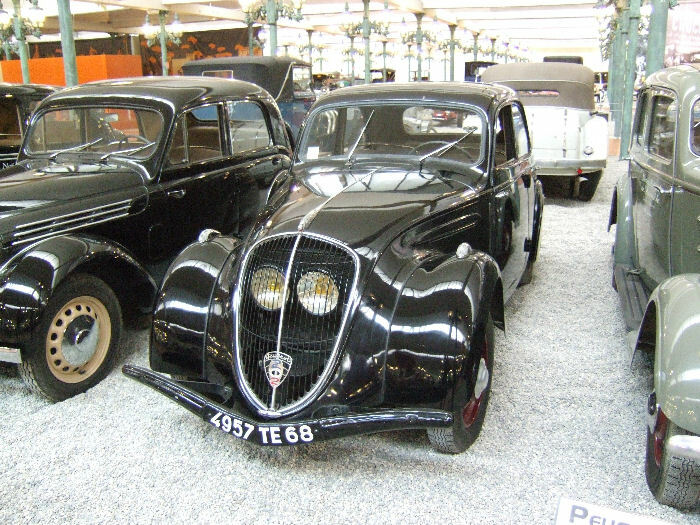 This example of what today is known as "The Doctor's Car" in Oradour, shows a Peugeot 202 and it is located in the French national motor museum in Mulhouse, Alsace, Northern France. Ironically the model type was known as a "Berline" (which can be translated as Berlin, but more usually as, Saloon). It is described as being front-wheel drive, with an engine of 1133cc capacity and capable of 105 km/h (65.5 mph). One notable feature of the car is the way that the headlights are installed behind the grill and it is noticeable that the Doctor's car at Oradour has the grill cut-away at these points. This car was originally registered in the Haut-Rhin, Department 68, of the Alsace Region of France.